Works well and fits my hand like a glove. I was very disappointed with this scrubbier. It didn’t have any strength behind it and did not help get any material off the plate or utensil unless it was presoaked for a long time, at which point even a paper towel could have removed it. We have replaced all our dish cloths with this product. It does as well as any dish cloth, if not better, and can be sanitized by cleaning in the dishwasher. It will outlast many dish cloths. I consider my hand average size for women. However, the scrubber is much too clumsly and large. A more narrow sponge would be good. The concept is good. Sponge works better than expected. Stays clean just what i needed. I have only used it a couple times and it does the job well for the purpose. O-ya it works just as advertised but then I got thinking about the thousand fingers on this thing and tried it in the shower. It did a great job exfoliating, my skin has never felt smoother. My wife love how it makes her whole body tingle. So bottom line we love it for more reasons then advertised. A bit too large and therefore a bit unwieldy. I cut mine in half. It is probably good to use to clean veggies but I am not SOLD on it for more than trying on dishes, pots and pans, especially if there is stuff stuck on bottom. In such a case I just boil a half inch of water in pots and pans and it ALL gets loosened up..better than this item could do. Found it a little to large in size but it worked well on dishes, cups and glasses. I like having thing at the sink but it doesnt replace the sponge entirely. I find that it doesnt quite have the scrubbing ability of a scrubbing sponge. I do like it for everyday dish washing and clean-up. I love it you can clean many dishes and pots and pans in a little while. I dont find much use for these as they are so soft they dont provide much scrubbing. However they do rinse clean. I found that it is kind of awkward to use at first but I primarily use it to clean my sink. I fold it in half in my hand and it works perfectly. This Little Scrubber was a Fantastic Purchase!! No More Germs on Germs after Cleaning the Scrubber in the Dishwasher..THANKS!! Silicone bristles are in no way stiff enough to tackle stuck on food in pots and pans. Now its just being used to wipe down the kitchen counter and stove. Having the chance to do it all over again, I wouldve saved the money. I bought this item because I thought it would scrub off stuck on food and clean easily. It cleans easily and thoroughly but doesnt work as well as a teflon sponge. I still have a hard time getting the cooked eggs out of the pan! Great way to clean and no dirt accumulation. Nice addition to the work area. I thought these in the gadget category but my wife and her sister say they are fantastic. Given their review, I ordered more for daughter and neighbor. It works! Very good at removing food particles. Easy to clean and it doesnt start smelling bad. This works really well in most cases. I use it instead of the sponge except when when pans/plates have stuck on food. Even after soaking I need to resort to the sponge to scrub. Regardless of that, this is good for most jobs, rinses easy and is really soft and dries quickly. I was very disappointed w/the product. Purchased couple extra for family members, but I will just probably give them away. I found them to be far too large & cumbersome, and not appropriate to the task of washing pots/pans/dirty items. not good enough for non coated cookware with moderately baked on food. great for newer coated cookware. Awesome scrubber. I have one for the kitchen and one for the bathroom and theyre great. 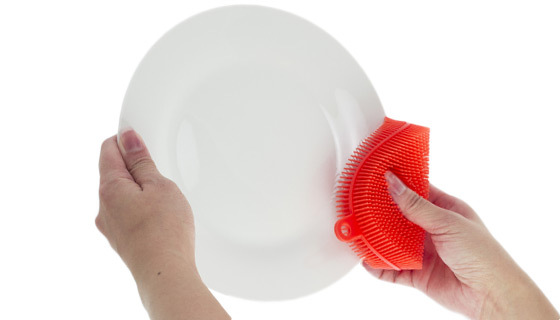 This scrubber is so useful because it is flexible where most scrubbers a stiff. Also it is so easy to keep clean because everything rinses off. I didnt expect much from this item, but on stick-free pans and pots, it is fabulous. Unlike a scrubee, it easily removes any dirt or grease that may have accumulated without any danger of scratching the pan. Less effective than an old fashioned dish cloth imo. You wont use it for a frying pan but if you want to wash smudges off glasses and other delicate kitchen items, its useful. Also, even though I microwave my sponges every couple of days I have the feeling they must be unsanitary. These dry completely and are obviously clean. IT IS GREAT FOR DOING THE DISHES BUT NOT TO CLEAN UP COUNTERS. GREAT FOR NON STICK PANS. Great for easy stuff, not for difficult scrubbing. I use these to clean my plastic kitty watering fountains and my treated frying pans non-stick surface. Not so good for un-treated scrubbing, does not actually scrub. Without a doubt, the best sponge we have ever used. Could never go back to the old fashioned- type sponge. Didnt like it really. Does not hold soap or water, so youre never sure if you are cleaning the dishes or just doing nothing! Easily cleaned, but a bit big for my hands. OK for lightly soiled plates, but too soft for scrubbing. soft enough so not to scratch the Teflon, delicate surface of the plate. Great color and attractive. If used instead as a potato/carrot scrubber, it does the job. Hard to believe, but these really do clean better than a sponge! Ive thrown all my stinky sponges away. Scrubber a little too big and stiff. Would have been better if it was circular. Splashes liquid back onto my face or clothes. It gets my dishes nice and clean. I had a little trouble at first because its size is large but once I got used to it, I scrubbed away. It dries up nicely in my dish rack and knowing its not retaining all the germs my sponge was, relieves my mind. I looked forward to this spong as a replacement for the scuffy pads we use. BUT it does not do the job:-. Its too big for my hand for one thing but my husband says it doesnt clean the way our other pads do. Unfortunately we have 2 of them and nothing to do with them. Simple, does the job, rinses easily, would recommend. Ive passed them to my family and theyve loved them. The product work really good, only one thing, it doesnt hold the soap in very long, but it does the job. Very durable. Works MUCH BETTER than sponges and always looks clean and sanitary. GREAT item. This is sturdy and works well. I wish it would hold the liquid soap a bit more, but its an improvement over a foam sponge that gets smelly and has to go in the washing machine. We like that you can toss it in the dish washer every couple of days. I also bought one for our cleaning person who loves to cook and she is thrilled with it too. Ordered two of these, as I was attracted by the promise that they would be relatively bacteria free and no doubt they are. Was nuking my prior sponges periodically. They do hold suds well but I have a problem with the feel. They are too large and rather thick compared to my old-fashioned sponges. Would prefer smaller, with bristles on one side only and a rough scrubbing surface on the other. Will likely use them more for cleaning veggies before cooking than for washing dishes. Doss not remove stuff stuck to plate. Fine if you just want to swish a plate. The fingers are too limber to do any scrubbing. However it makes a good support to dry the sponge. Works great on all my cookware, especially my cast iron. Its one of only two products purchased here that I wasnt completely happy with. The bristles are too short and flexible to do much good with my glassware and china, much less anything needing a good scrub. Imsure I can find some use for it, just not what Id planned on. They do stay clean as they do not allow dirt to absorb into spores. These silicone scrubbers dont have spores. I use them at my kitchen sink for a lot of purposes. I even like them to place my bars of soap on. People will have their preferences between a sponge or one of these. I like these silicone scrubbers for my purposes. This will not scrub/scour anything as the silicon is way too gentle; but for regular quick cleanup, its very nice and I use it every day --- no mess, no scent, simple. It does replace my sponge. It doesnt replace a scour pad. So, it is not intended for burnt on food. It works well for coffee cups, silverware, eggbeaters, getting to the bottom of a blender or anything where you need to clean between blades. Also, it does not retain water. I hang it on a hook above the sink and it drains do there is no leftover odor. Works well. A little too big for small hands. You can cut it in half and have 2 pieces. Still work well. This does work as a scrubber although it has a tendency to stick to the sides of a metal sink. It definitely does not replace a sponge. The sponge absorbs water. This does not and when you clean an area with it you have to either get a sponge or a towel to remove the excess water. I like this scrubber because I can use it on any surface. Its a great helper in the kitchen and bathroom! EXCELLENT. DOES A GREAT JOB. CLEANS FASTER THEN THE SMALL SCRUBBERS. LOVE IT!!!! Although cleans well, it is tough to maintain a grasp on it! Used it to clean burnt in coffee on my coffee maker and it cleaned it completely and easily. Absolutely love it,as does my daughter as I bought two. Easy to use and very effective. Kudos to whoever thought of this!! The pad is a bit too flexible. It feels good in the hand but cannot get off crusted debris on dishes. Does a good job otherwise. Works very well and will not scratch non-stick surfaces. I bought the thin ones a while back and they worked great, but my hands are a bit big and holding on to them proved to be troublesome I also got the wood scrubbers with them. When I saw the BIG RED scrubber, I bought 2. Fit my hand perfectly. My wife loves that I like it, so I get to keep doing the dishes. Its OK... she did them for us for over 50 years. Its my turn! Great scrubber. Recommend it 100%. This thing feels like it will last forever without being replaced. Easy to use and to clean. I like it a lot. Ive only used it once. My husband has used it more and said he liked it. Im sorry that I cant give a better review at this time. Does the job and the ability to put in the dishwasher to use over and over makes this an economical purchase. cleans well, washes up great in dishwasher. it is not a scrapper. Its been really nice to throw away the smelly scrubbers we used to use. The only reason for 4 stars instead of 5 is that I wish it was a bit more rigid to scrub away heavier food residue more easily. It is DEFINITELY NOT A SCRUBBER..enough said! This item replaces the sponge in the kitchen and bathroom: is still under evaluation. The slimy sponges have been removed but so far this has not removed stuck food on pots and pans as well as the sponge. 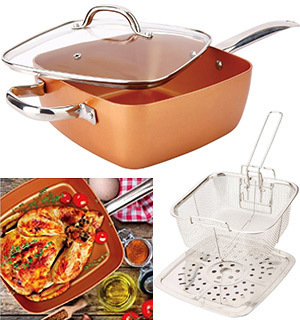 This item works great & is fine for non-stick pots & pans. Im VERY happy with it! As other one-star reviews have stated: big, clumsy, and super soft. 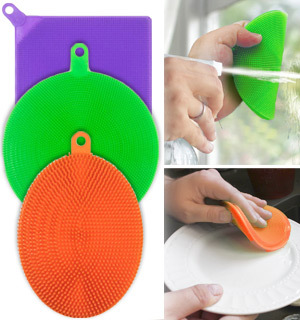 You can scrub more residue off your dishes with your bare fingers. I was too embarrassed by the quality to pass them on to anyone else. 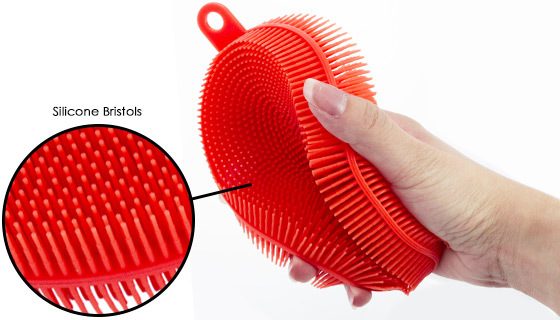 This scrubber works good and cleaning after use is quick and easy. Mother scrubber feels good in your hand. I use this scrubber all the time. Works great doing the dishes. I hate doing dishes, but this helps a lot. 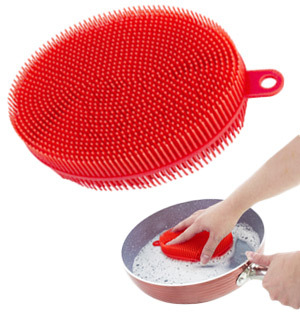 This scrubber is large enough to hold on to and doesnt slip. The silicone is good quality. I tried to use it to remove burnt butter from ceramic fry pan, and it didnt get it off. I would recommend this for light to moderate jobs. I really like the Scruber. My sponges were disgusting even after running them through the dishwasher. The Scruber is big and flexible so it reaches into deeper glasses, coffee carafes and water bottles easily. Great product to throw into a housewarming package or for college kids living off campus. This item does not have enough cleaning power. Too soft. I get more cleaning power from a terry cloth. I thought this would be a fantastic product but am very disappointed. It is not flexible enough to get inside small spaces cup, glass, etc. You still need to have a sponge, cloth, paper towel, etc. available to wipe not the sink and counter. I am sorry I wasted my money on buying two of these. I love the scrubber. It is tough on problem areas in my sink and I can wash away grime with one swipe. It rinses clean and dries fast. OK for some things, but doesnâ€™t replace my pot scrubber or other tough jobs. 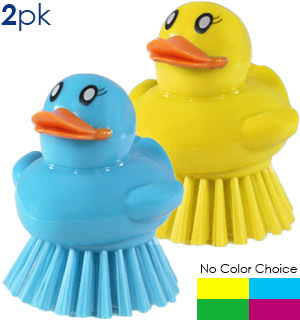 I love these scrubbers, they clean anything and rinse clean unlike the sponge I was using. 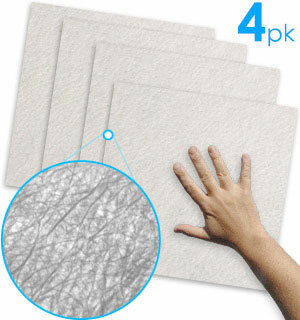 Works well - great on teflon or surfaces that scratch easily and it doesnt carry any odors. Worthless for picking up spills, doesnt hold water, just pushes it around. Not very good as scrubber as bristles too weak! So far so good. It gets food off plates and I dont have to spend extra time getting the food scrubbed from the plates out of the scrubber itself. This so-called super sponge is not a great as I thought it would be. Seems it is not flexible enough and the soap does not cling to the sponge very well. Silicone scrubber is more sanitary than cloths or sponges, seems to be sturdy so it should last a long time.Gave one as a gift already. This scrubber is way too soft to do any good. It is almost like using a dish rag to scrub a non-stick skillet. I am VERY disappointed! Im glad that the cost of this item was reasonable. I do not find the scrubber to be effective while doing dishes by hand. The bristles are too soft to do a good job in removing baked-on material after cooking. Also, the scrubber does not really hold soap well. I like it except pans still need an abrasive item to remove stuck-on food and bottom of the pans to shine. Not what I expected from the discription. Thought it would do a better job on pans. Great for Dishes and General Cleanup in the kitchen. Dishwasher safe. The Silicone Super Scrubber stays clean and does scrub well. It is not really very good about wiping spills. Still need a sponge to perform that task. I was searching for a sanitary alternative to a sponge and a email from Pulse came and there it was-Silicone Super Scrubber Item #8040 Perfect!! Love it. Rinses clean-no musty smell. Pretty much a fail for us. Really it doesnt clean as well as I had hoped. Fair on dishes, a fail on pans. We now use it to help air dry our sponge. It does work but still have to use sponge sometimes. It is easier to clean than sponge and easier to handle. Scrubber is to soft to really get the stuck on food off. I actually think this scrubber would be a little better and easier to handle if it were smaller and the bristles a little shorter. Other than that ... an OK product. The pro is that it stays clean and sanitary. The big con is that it is too flimsy to provide any pressure to anything. The prongs are long, soft and totally flexible. It wont remove anything. Another con, in my opinion, is that its just a little too big...doesnt fit easily into a glass, for instance. Not a good scrub pad. Not impressed with these scrub pads. 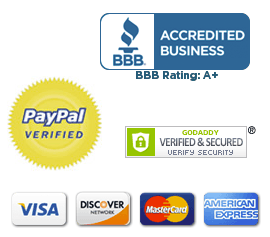 They are very soft and rubbery and dont do a good job of cleaning pots and pans and dishes. I quickly had to grab the sponge with the scouring pad on one side to properly clean my dishes. I threw these in the trash. Waste of money. A good scrubber...got one for a friend and she loves it! This sponge is too bulky for my hand. Also cannot be used to wipe down a counter. I guess it is useful for pot-scrubbing. I love the idea of no germ breeding sponge. It is very convenient to toss them into the dishwasher. My only suggestion is that these were manufactured in different sizes. This size is great for larger hands, but a smaller version would be very well received. Good for pots & pans but not good for wiping counter tops. The scrubber works very good with one real flaw. It is too large. If youre only washing large pots its fine. Purchased this and absolutely love it. It cleans all of the dishes and pots well plus cleans up well. I will definitely purchase more after the holidays.